A WEEKEND OF BBQ, CRAFT BEER, BOUTIQUE WINE, AND MORE! 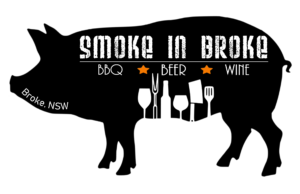 Smoke in Broke is a weekend of BBQ, Beer, Wine, Music, Friends, Kid Activities, and more… We will have an Steak Cookoff Association and an ABA sanctioned BBQ competition this year in Broke, NSW. A unique format which will see the public tasting the competition BBQ directly from the teams on weekend. There are cash prizes to be won, so grab your BBQ and enter now! Held over the June Long weekend in 2019 we are providing a 2 day festival of BBQ, Beer and Wine, coupled with some music, good vibes and a Saturday night Bon Fire. (More details to come on Event Info and timeline). Open to the public with a $7 entry fee online at Eventbrite There will be BBQ cooking demonstrations, a Butcher’s showcase, Music, Local Craft Beer and the Local Boutique Wines on Offer. For more information, Like and Share our Facebook Page or message us.